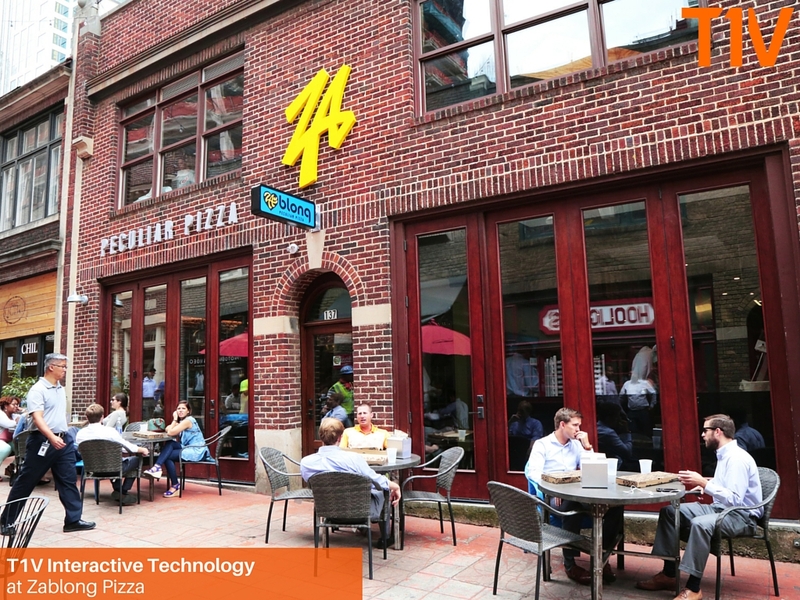 Zablong Pizza concept takes off in Charlotte, NC, with T1V Interactive Technology as an integral component in delivering a unique and engaging customer experience from start to finish. We wanted people to be able to take selfies together, play games together, engage with the brand together. We quickly realized we needed a centralized screen where people could do these things. 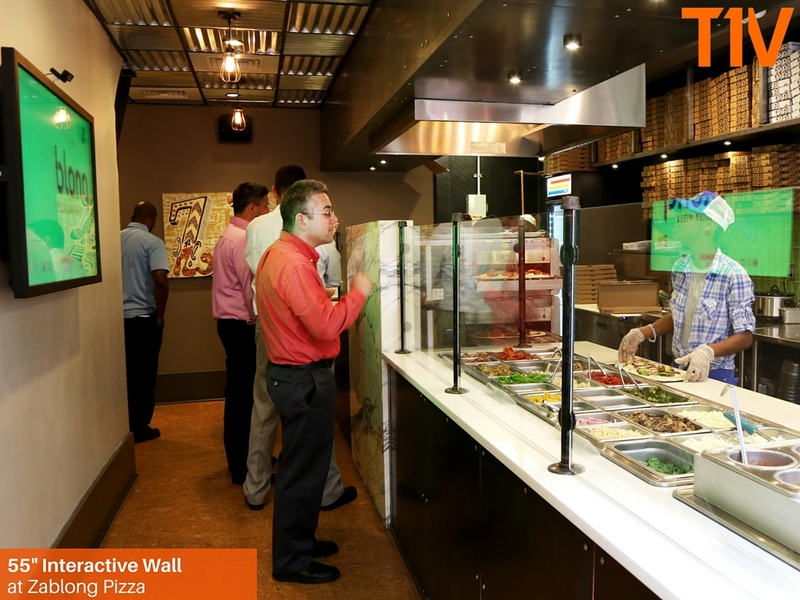 Zablong Pizza's fast casual restaurant concept launched in early 2016, and features T1V Interactive touchscreen technology as part of the unique experience it provides its patrons from start to finish. When speaking to Zablong Co-founder Steve Young on how they came up with the idea, Steve references a desire to create an experience for their restaurant-goers that is interactive from the moment they walk in the door. Once the customer enters the location, they’re able to pick their pizza dough, select a variety of toppings, and then the pizza is in the oven. It’s at this point that the customer must wait...so Steve and his partners thought, what can we do with this time? 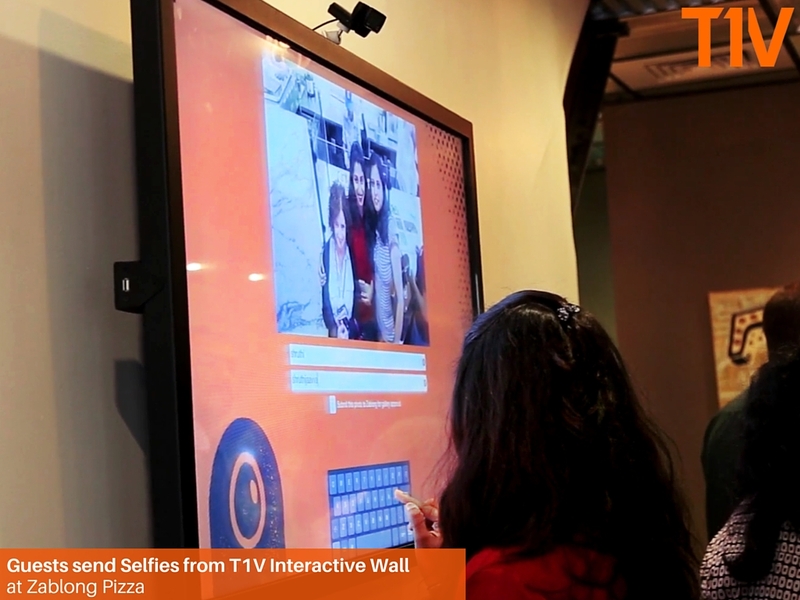 Young and his team had seen other examples of touchscreen technology deployed in different environments, and thought it would be a great opportunity to infuse another interactive touchpoint in the Zablong experience. After doing a search for a technology partner, Zablong came across Charlotte-based T1V, who specializes in interactive, multitouch software for touchscreens, and has been developing this very technology since 2008. The Zablong and T1V teams joined forces to develop the interface that Zablong patrons have access to today. Customers can play Zablong- branded games, design their own Zablong logos (which they can then submit to the Zablong team to publish), and take selfies with their friends while waiting for their pizzas to cook. Through these customer-generated content outlets, Zablong patrons are able to contribute to what Zablong means to them, thus serving as active participants in the Zablong community. 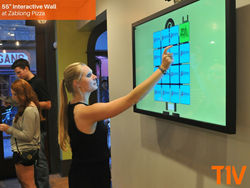 Experience T1V Interactive at Zablong Pizza at the Latta Arcade at 137 Brevard Court in Charlotte, NC. T1V creates interactive touchscreen experiences. Deliberately large in size and incredibly durable, our Interactive Platform includes tables and walls, digital signage, and mobile apps. Our products are powered by patented multitouch, multiuser software that transforms public spaces into more dynamic environments. The T1V team is made up of design, engineering, business and technology minds alike resulting in unrivaled support to our customers from start to finish. Based in Charlotte, NC, T1V works with corporate, events and exhibits, entertainment, hospitality, retail, and education markets around the globe. The company is recognized as one of Charlotte’s Fast 50 by the Charlotte Business Journal and was named to the 2014 and 2015 Inc. 500 | 5000 by Inc. magazine. Visit http://www.t1v.com to learn more about our products and how we can work with you and your industry. To see more, visit http://www.t1v.com/showcase/videos . you sometime in the not-too-distant future! to spark your curiosity and creativity, so come on in and be inspired!